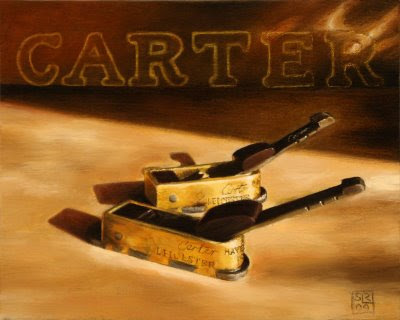 Twin Carter Mitre Planes, brass with ebony infill, oil on canvas board, 8" x 10"
This painting of my twin mitre planes--planes given to me by the very generous Bill Carter, planemaker, and his wife Sarah--should be on a plane en route to Bill and Sarah right about now. To read the whole long story, click here. I thought I had completed the painting a couple of months ago, but several things about it continued to bother me. So, just when I was on the verge of sending it off to Bill and Sarah, I unpacked it and put it back on the easel. 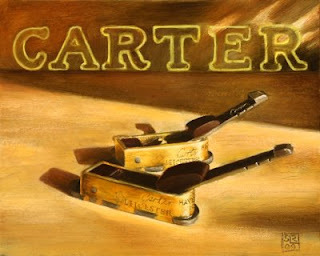 I made some minor changes and then painted a dark glaze over much of the background, obscuring but not omitting the Carter name in the background. Normally, I'm not a fan of oily paint and prefer a fairly matte surface on my finished paintings--especially my portraits, but something about this still life seemed to lend itself to a little more gloss. Although it won't be apparent on screen, my changes affected the sheen of the painting and gave it a richness the original lacked. I'm much happier with this new version and hope it will find a good home with Bill and Sarah. Very very nice. I am sure they will be honoured. I think the choice of the glaze was an excellent one. Thank you very much, Paul. I'm glad you prefer the revised version to the original. The painting looks great. I like the toned down “Carter”. I am sure Bill and Sarah will be thrilled. Once I have a couple of commissions out of the way, I'd like to try a portrait of the Japanese saw. Hand tools make very compliant and obliging subjects, better even than fruit or flowers. Hey Shannon - whenever you are ready the saw will be ready... or any of the others you might want to try.